Gemini is another Minecraft hacked client with lots of features. As some of the most important we can mention ESP (kind of wallhack), Xray (very popular in Minecraft hacks), fly, combat cheats (like Auto soup) and of course the console where you can use all the commands from below. 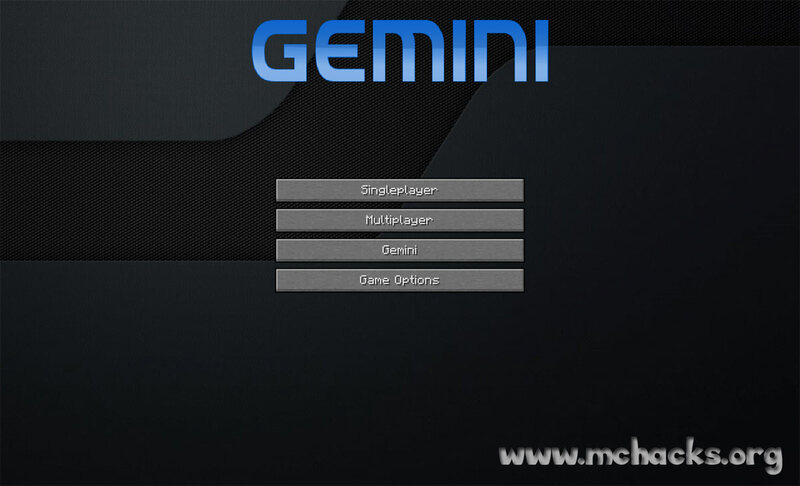 It works in multiplayer (so be aware that you don’t get banned) and has its own menu in-game. AutoBlock [NCP] – Automatically blocks when using KillAura. AutoJump [NCP] – Automatically jumps for you. AutoSwim [NCP] – Automatically swims for you. AutoTPAccept [NCP] – Automatically accepts /tpa requests from users in your friends list. Fastbreak – Breaks blocks faster than usual and gets rid of the break delay. Fastplace – Removes the right click delay. Fly – Allows you to fly. NoCheat [NCP] – Alerts you when you turn on a mod not compatible with NCP. NoSwing – Stops the swinging animation. Step [NCP] – Automatically steps up a full block when collided horizontally. Xray – Allows you to see through blocks to find ores. alloff – Turns off all mods. bind add [mod] [key] – Sets the keybind for the specified mod. bind del [mod] – Removes the keybind from the specified mod. 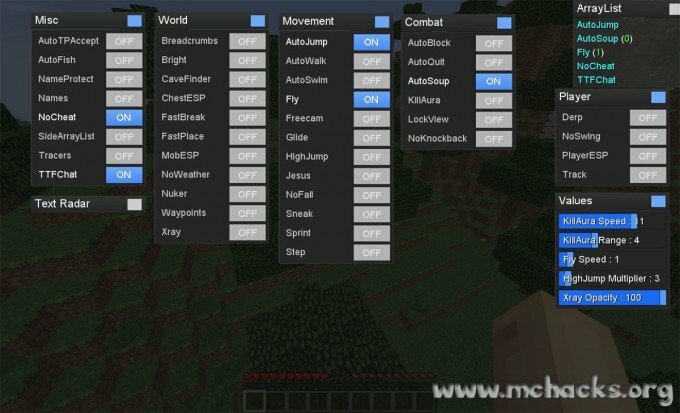 bind show [mod] – Shows the current keybind of the specified mod. cmdprefix set [char] – Sets the chat command prefix. commands – Lists all commands. enemy del [username] – Removes a user from the enemy list. enemys clear – Clears the enemy list. fly set [val] – Sets the fly speed. friends clear – Clears the friends list. friend del [name/alias] – Deletes a user from the friends list. getitems [username] – Shows the player’s items, enchants, etc. 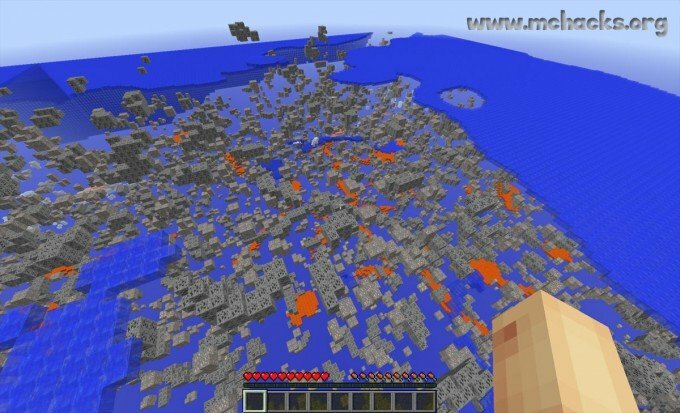 help [mod] – Shows the description of the specified mod. highjump set [int] – Sets the highjump multiplier. 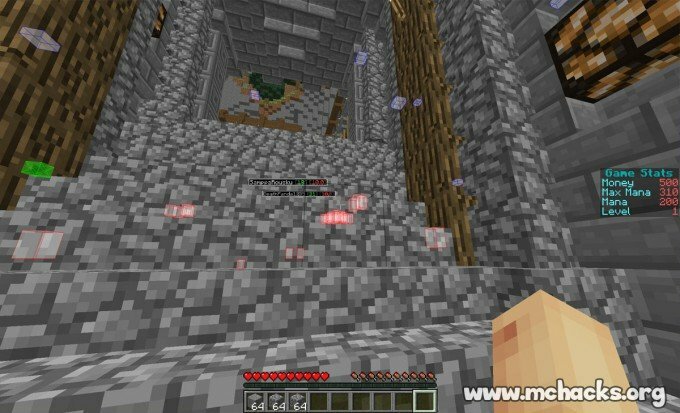 killaura mode [players/mobs/both] – Switches between the KillAura modes. nuker set [BlockName/ID) – Sets the target block for Nuker. nuker mode [instant/click] – Sets the nuker mode. track [username] – Sets the Track username. waypoints add [name] [%r] [%g] [%b] – Adds a colored waypoint at your current position. waypoints clear – Clears the waypoints list. waypoints list – Lists the waypoints. waypoints del [waypoint] – Deletes the specified waypoint. xray add [BlockName/ID] – Adds a block to the xray list. xray del [BlockName/ID] – Deletes a block from the xray list. xray set [%] – Sets the xray opacity. In “Use verison:” choose “release [Client name]“.